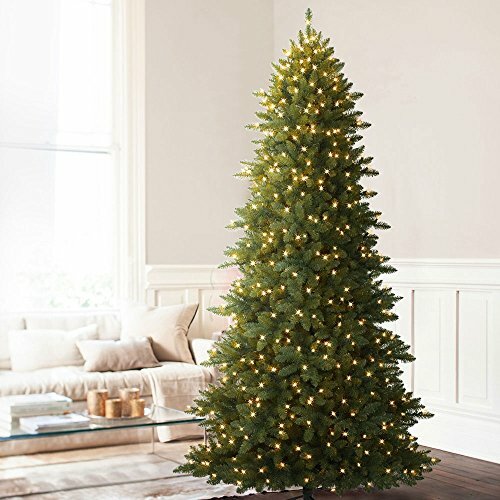 Balsam Hill's 9-foot Berkshire Mountain Fir™ Artificial Christmas Tree is designed with an "in and out" branch style that gives this narrow tree a full appearance. Crafted from Classic Needle foliage, it features light green and grass green tapered tips accented by light brown stems for added depth. This fir Christmas tree is pre-lit with clear lights and has hinged branches for fast and easy setup. Our PVC Classic Needles are used to create most of our traditional trees and provide fullness at an affordable price. These are the soft, flat needles found on traditional artificial Christmas trees. Our Heavenly Lights add sparkling radiance to your Christmas tree. The lights are professionally hand-strung to reduce the appearance of wires. Balsam Hill™ is committed to providing our customers with a picture-perfect holiday. Backed by the Good Housekeeping Seal, our trees have been featured in television shows, magazines, and celebrity homes. With convenient hinged branches and hand-strung pre-lit options, our trees let you sit back and enjoy Christmas to the fullest. Our wide range of styles and sizes ensure you will find a tree that fits perfectly in your space. We also have a selection of beautiful wreaths, garlands, and Christmas decorations to put the finishing touches on your home this holiday season. Narrow shape, measuring 9ft high (with stand), 54in in diameter. Tree pictured is 7.5ft tall.